What Can I Do About Mud Fever? Learn how to treat and prevent this common bacterial infection, which leaves painful sores on your horse’s heels. Correctly called pastern dermatitis, mud fever is a common skin condition in horses, particularly in the spring. You’ve most likely heard of it referred to by one of its many names: scratches, grease heel, dew poisoning or, commonly, mud fever. 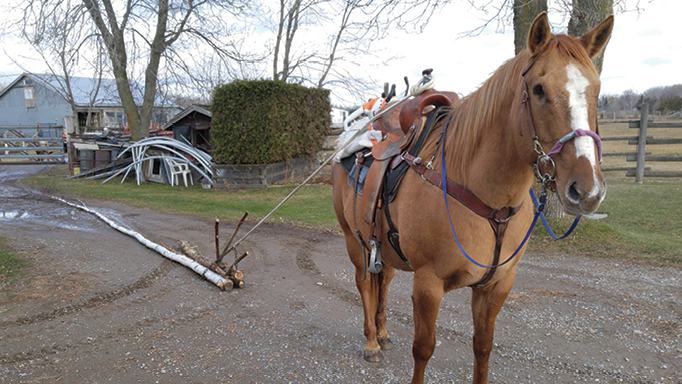 As any horse owner who has dealt with this problem knows, it can be particularly frustrating to treat and manage. A fungus-like bacteria called Dermatophilosis congolensis is the primary cause of pastern dermatitis. D. congolensis is normally found on the horse’s skin and usually doesn’t cause a problem. However, when moisture or other factors cause chapping and cracking, the bacteria can penetrate the damaged skin and cause infection and inflammation. Other predisposing factors may be present and can exacerbate the disease process. Moist conditions: Moisture promotes the causative bacteria, D. congolensis, to replicate and produce “zoospores.” These zoospores penetrate damaged skin and cause a reaction. Morning dew on pastures, heavy rainfall and muddy conditions can be particularly problematic. Insects: Bites from ticks and flies damage the skin, allowing bacteria to penetrate. Insects can also transmit the bacteria from horse to horse – resulting in the spread of infection. 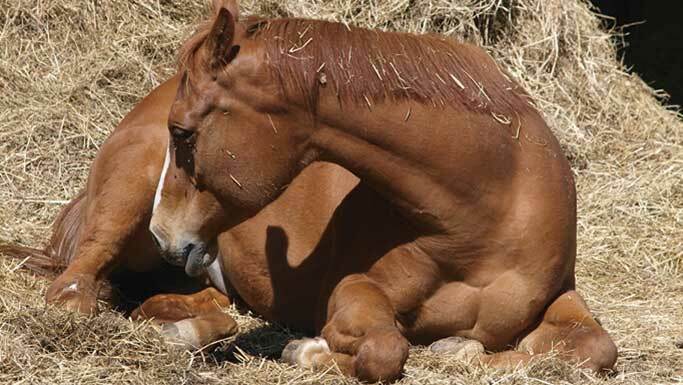 Mites can irritate the skin and hide in the hair around the horse’s foot. Environment: Rough vegetation and stubble fields can damage the skin on the horse’s heels – predisposing them to infection. Alkaline soils (eg. clay) are also irritating to the skin. Photosensitization: A heightened skin reaction, photosensitization occurs with direct exposure to sunlight. This is why the lesions usually occur on white areas of the leg. Anecdotally, photosensitization seems to be worse if horses are grazing on clover or alfalfa. Secondary infections: Once D. congolensis lesions have developed, it becomes easier for other bacteria to also become involved. Staphylococus and Pseudomonas organisms are commonly implicated in secondary infections and cause even more inflammation. In some cases, there may also be a fungal infection present. Individual horse: Some horses seem to be more sensitive to developing pastern dermatitis and have a more severe reaction. While researchers believe there is a genetic component, they have not identified a specific gene. 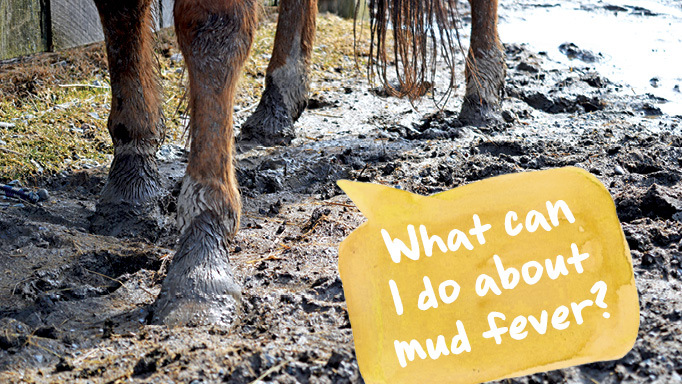 What are the clinical signs of mud fever? Affected horses have characteristic scabbing lesions on the back side of the pastern and fetlock, with white areas much more commonly affected. When the scab is picked off, it pulls away from the skin with a tuft of hair and pus is present underneath it. The surrounding skin is often reddened, itchy, swollen and sensitive. In severe cases, swelling may extend up the limb resulting in cellulitis (bacterial infections of the skin and underlying tissues), which can be a serious condition. Pastern dermatitis is very painful, and severely affected horses are often lame and need to be rested until the lesions resolve. How is mud fever treated? The most important part of treating pastern dermatitis is to manage all of the predisposing factors. While it may seem to be an easy disease to identify and treat on your own, it’s important to involve your veterinarian in the process, as it can become a serious disease. 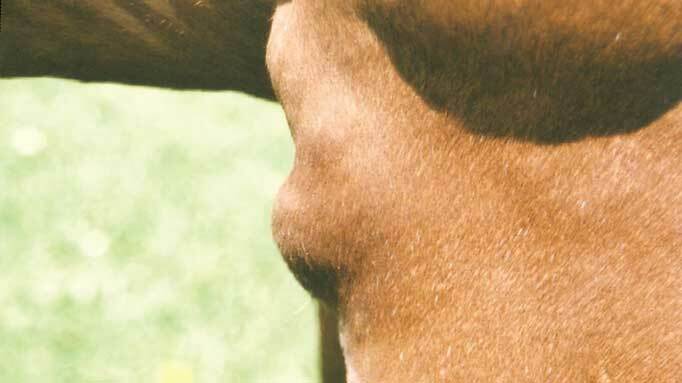 With improper treatment, a horse may have frequent flare-ups and the problem can persist for months. If lesions are present on the horse’s pastern, the area should be clipped to prevent matting of the hair with serum and pus. This also prevents serum scald, which occurs when there is sufficient skin damage for serum to ooze out onto the skin – scalding it in effect. This happens with bad diaper rash on children and “hot spots” on dogs. So, it’s important to clean off the serum and protect the normal skin to prevent serum scald. Clipping also improves air circulation to the skin, helping keep the skin dry and healthy. After clipping, be sure to clean and disinfect the clippers very well since pastern dermatitis can be transferred between horses on clipper blades. Wash the pastern with an antibacterial soap such as chlorhexidine (Hibitaine®) or iodine (Betadine®) scrub. After washing, make sure to use clean towels to thoroughly dry the leg. The scabs should be gently picked off of the skin, but this can be a very painful process for the horse. Your veterinarian may need to sedate your horse before removing the scabs. You can use ichthammol ointment or zinc oxide cream to soften the scabs making them easier and less painful to remove. Since bacteria cause pastern dermatitis, veterinarians often prescribe antibiotics as part of the treatment. Antibiotics should always be used under your practitioner’s advice, and, in most cases, topical antibiotics applied directly to the lesions are effective. If the infection is more severe or has started to ascend up the leg, your horse may require more aggressive therapy with systemic antibiotic treatment. Your veterinarian may also use topical corticosteroids to treat severe lesions. Corticosteroids reduce inflammation, which helps alleviate pain and swelling. Some veterinarians make a specific scratches cream or wound cream that contains both antibiotics and steroids for their pastern dermatitis cases. If you have competition horses, you should avoid using creams containing procaine penicillin G, as the procaine may be absorbed through damaged skin and result in positive drug tests. Your veterinarian may prescribe pain medications, such as phenylbutazone (bute), to help make your horse more comfortable. Affected legs should be wrapped to keep the topical medications in contact with the lesions and to prevent exposure to direct sunlight and moisture. For problem horses, it may be worth trying silver-impregnated wraps. Silver has antibacterial properties that may help to control the bacterial component of pastern dermatitis. Horses may need to be stalled to keep them out of moisture and direct sunlight until the lesions have resolved. Removing horses from morning pastures with dew can also be very beneficial. It can take weeks of diligent daily therapy to completely heal the lesions, and to prevent recurring infections, it’s important to ensure that the lesions have completely resolved before discontinuing treatment. How can mud fever be prevented? • Reducing moisture in your horse’s environment is key to controlling pastern dermatitis. Manage your pasture and paddocks to prevent mud and standing water. Try rotating pastures and paddocks to reduce mud and use electric fencing to keep horses out of particularly wet and muddy areas. • Excessive bathing or washing the legs can predispose a horse to developing pastern dermatitis. If frequent washing can’t be avoided, try applying a barrier cream, such as Vaseline®, to protect the skin. Always dry your horse’s legs off well after bathing. • Feathering on the fetlock should not be clipped unless there is active pastern dermatitis present. Hair on the back of the fetlock helps wick moisture away from the skin. Managing a horse with pastern dermatitis can be a frustrating experience. To ensure that you get this disease under control, work with your veterinarian to immediately diagnose and effectively treat the condition. For problem horses, it’s important to identify all predisposing factors and eliminate as many of them as possible. Veterinarians usually diagnose pastern dermatitis by identifying the characteristic lesions – they rarely require additional diagnostic tests. However, it’s important to consult with your veterinarian to differentiate it from other possible conditions. • Vasculitis (inflammation of the blood vessels) results in swelling and red lesions that may affect the limbs. There are many causes of vasculitis, but it is commonly caused by drug reactions, such as those seen with penicillin, or by Streptococcal infections such as strangles. Vasculitis typically affects all four legs and is not limited to white areas. • Cellulitis causes a swollen, warm, painful leg. While it can occur secondary to severe pastern dermatitis, it can also happen with bacterial infections from other sources, such as a wound on the leg. Equine Recurrent Uveitis doesn't have to be the end.